Winter is pretty lacking in fresh local produce, but an abundance of beautiful citrus fruits is in season and widely available now. And more than ever, you can find them organically grown. The genus Citrus encompasses the many species, crosses, and varieties that produce the various jewel-fleshed fruits we know today. The fruit of Citrus is botanically referred to as a hesperidium—a modified berry with a thick leathery rind called a pericarp. Within is a spongy ovary wall (the pith), and carpels (segments) filled with juicy, vitamin-rich vesicles. Citrus trees and shrubs have been cultivated for more than 4,000 years and are thought to have originated in parts of India, China, Australia, New Caledonia, and New Guinea. Citrus plants readily interbreed, producing hybrids as sour as the Seville orange or as sweet and ambrosial as the Cara Cara, a red-fleshed orange discovered growing on a ranch by that name in Venezuela. Each has a distinctive flavor and culinary characteristics depending on its genetics, where it’s grown, and when it’s harvested. Citrus grow naturally in tropical or subtropical climates. They are commercially viable only in areas where there is some seasonal change but no sustained frost. Cooler fall weather induces color change but not ripeness, so growers must taste the fruit to test its balance between sweet and sour before picking. Citrus fruits stop ripening after they are picked since they don't possess starches that turn to sugars, like fruits such as pears or peaches. 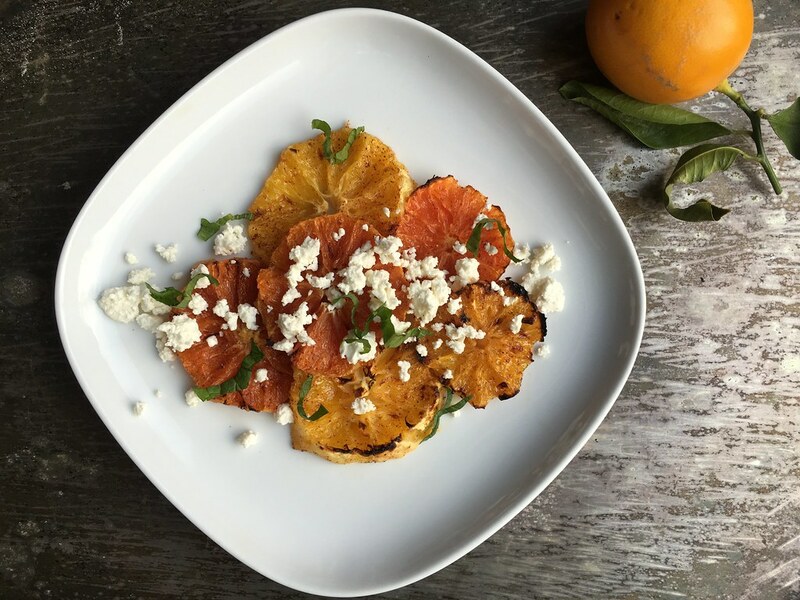 They are certainly delicious fresh, but oranges, grapefruits, lemons, and other citrus fruits are also wonderful cooked or preserved for marmalades, roasted tagines, salsas, and this broiled fruit salad with feta and mint. It takes just a few minutes and is an excellent salad for opening up the palette before a heavy winter meal. Peel the fruit. With a very sharp knife, carefully slice into rounds about 3/4-inch thick and place onto parchment-lined baking sheets. Combine the sugar and spices in a small bowl and generously sprinkle over the fruit slices. Broil on high for 5 to 10 minutes, watching carefully. When the edges become dark and slightly caramelized, remove them from the oven and allow to slightly cool. Whisk together the oil, lemon juice, salt, and pepper. Transfer several rounds to each serving plate and drizzle with the dressing. Sprinkle the feta over the top and garnish with mint. Serve immediately. The Eat Local series features seasonal, locally available ingredients and recipes. It was the recipienct of a 2016 Silver Medal for Blog Writing from the Garden Writers Association.